Commemorative brochure for the official opening. 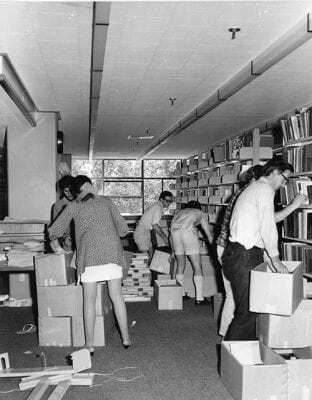 University of Auckland Library historical collection. MSS & Archives E-10. The Library, which took more than two years and cost $2.5m to build, was quickly open for business and by April students were reportedly appreciating, “the functional, aesthetically satisfying building, and the greatly increased seating, at individual, mostly screened, tables.”2 This was in marked contrast to the cramped conditions they had endured in the ClockTower. Unpacking and shelving. University of Auckland Library historical collection. MSS & Archives E-10. Designed by architects Beatson, Rix-Trott, Carter & Co to eventually house 500,000 books and seat 1,100 students, the Library initially occupied the lower four levels, while the English Department and Law School occupied the upper floors. 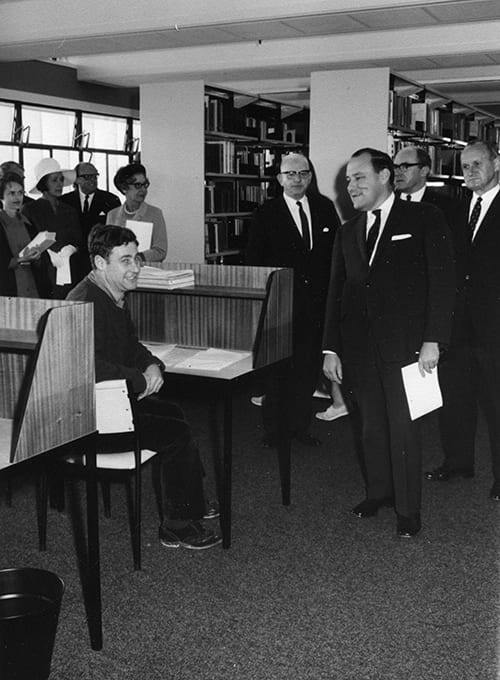 Among the library facilities were dedicated study areas for visually impaired students, a bindery and air-conditioned storage for rare books and archives. A commemorative brochure noted that the building’s main design feature was “the truly impressive main floor and ingenious ceiling-lighted mezzanine”.3 The Library also showcased the works of leading contemporary New Zealand artists including Don Binney, Kees Hos, Colin McCahon, Irene O’Neill, Stan Palmer, and Alison Pickmere. These works form part of the University’s Art Collection. The building was due to be officially opened by Arthur Kinsella, Minister of Education, on Saturday 26 April 1969. However, a ‘chill’ laid Kinsella low and Rob Muldoon, Finance Minister, was the last-minute stand-in. So last-minute that the plaque unveiled by Muldoon (dubbed in Craccum as the “effective miser of Education”)4 bore Kinsella’s name. According to the New Zealand Herald, Muldoon quipped: “This is the most inaccurate thing I have done for some time.” 5 Although Vice-Chancellor Kenneth Maidment said the Kinsella plaque would probably remain, its whereabouts is now unknown while one bearing Muldoon’s name is preserved in Special Collections. Muldoon tours the Library. 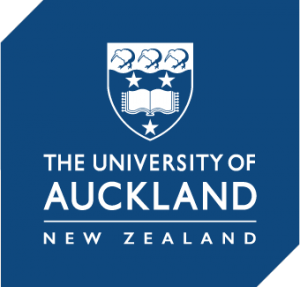 University of Auckland Library historical collection. MSS & Archives E-10. Photographs of the official opening and related items are on display until 10 May outside Special Collections, within the General Library on Level G.
1 Johnson, O.A. (1988). The true university: a short history of the University of Auckland Library 1883-1986 Auckland: University of Auckland Library, p.23. 2 Events. (1969, April, Vol. 11, No. 1). University of Auckland Gazette, p.9. NZ Glass Case 378.95 A89u, Special Collections, University of Auckland Libraries and Learning Services. 3 University of Auckland Library commemorative brochure. 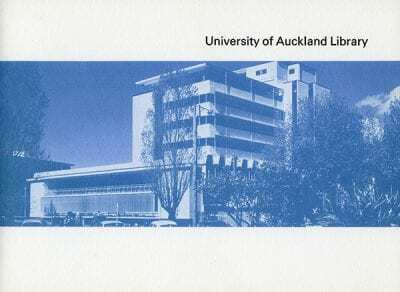 University of Auckland Library historical collection. Part 1. MSS & Archives E-10, file 8/2, Special Collections. 4 Muldoon Opens Library Kinsella Is Sick (1969, 1 May). Craccum, p.16. 5 Minister Is Stand-In At Opening (1969, 28 April). New Zealand Herald, p.5. 6 Muldoon Opens Library Kinsella Is Sick (1969, 1 May). Craccum, p.16. 7 Minister Is Stand-In At Opening (1969, 28 April). New Zealand Herald, p.5. 8 Muldoon Opens Library Kinsella Is Sick (1969, 1 May). Craccum, p.16. 9 Sinclair, K., Progress at the University, 1950-1970 (1970, April, Vol. 12, No. 3). University of Auckland Gazette, p.28. NZ Glass Case 378.95 A89u, Special Collections. 10 Where have all the Architects gone (1969, 25 September). Craccum, p.14.